Emory senior Ian McCall, a co-founder of the Campus Bubble, introduces students to the Emory Bubble during 2012 Fall Orientation. Photo by Nir Levy. 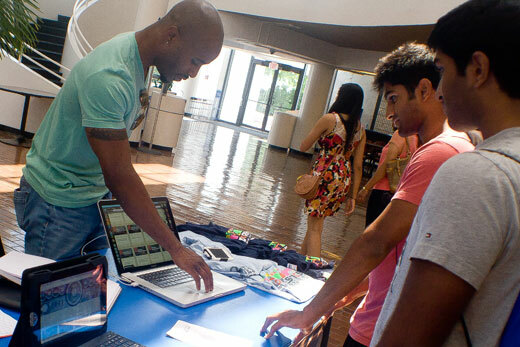 This fall, Emory students have a new way to stay connected — The Emory Bubble, a student-created web portal that aspires to be the go-to social media platform for organizing information about campus groups and events. Created by four Emory undergraduates, the web application offers a way to keep track of activities beyond the classroom, presenting a calendar of events and information about campus organizations, sports, dining and area nightlife options. It's also the first homegrown undergraduate start-up licensed by the University to bear the Emory name, says Todd Sherer, associate vice president for research and executive director of the Office of Technology Transfer (OTT), which helps Emory researchers bring their ideas to the marketplace. "It's not all that common that undergraduate students become innovators, but it's something we're trying to encourage," Sherer acknowledges. Emory isn't alone in recognizing student talent. The team behind The Emory Bubble was recently featured in a New York Times article about a new wave of undergraduates attempting to develop "the next big idea" while still in school, fueling a rise in campus incubators across the nation. In fact, data from the National Business Incubation Association now indicates that about one-third of the 1,250 business incubators in the U.S. are based at universities, offering support and mentoring to the young start-ups. Co-founded by Emory seniors Nir Levy, Ian McCall, Giovanni Hobbins and Pat Shea, who graduated from Goizueta Business School in May, the project was initially envisioned as a blog site where Student Media Council groups could share information. But soon, they imagined a larger application and audience. Something that would unify campus information for students into a central hub. They teamed with Levy and Hobbins, who had experience designing websites, to form The Campus Bubble, LLC, with plans to eventually take the "bubble" concept to other university campuses. Their vision was bolstered when team members submitted a business plan for The Campus Bubble in the Queen's Entrepreneurship Competition, one of the largest undergraduate business plan competitions in Canada. Though they didn't win, they were chosen as finalists — an honor that came with a $10,000 in-kind prize. Last fall, the student team conducted a beta launch of the Emory Bubble to help solicit feedback and polish their product, attracting some 4,000 users. The latest version of the website — relaunched in time for the 2012 freshman orientation — is designed to help students "search through the noise" of campus life and decide what is useful. The goal is to improve campus connectivity, which can sometimes feel fragmented and overwhelming, McCall says. In time, the new site will integrate more multimedia content, including links to Emory Wheel news articles and online video. A mobile app should be available later this fall, according to Levy. To gain permission to use the Emory name, the team partnered with the OTT to create a special licensing agreement — the first of its kind for a student start-up. In exchange, the University receives a nominal equity stake in the fledgling company. The arrangement not only lends credibility for the young entrepreneurs to approach other institutions, but they also receive business mentoring, advice and guidance. Though the arrangement is unusual, it could help build a foundation for other student endeavors, Sherer acknowledges. "Success breeds success," he says. "You never know when someone approaches you if they have done their homework. These guys were impressive, creative and diligent. It makes you feel good about the caliber of students we're attracting and turning out." Charles Goetz, a senior lecturer in entrepreneurship at Goizueta Business School, has served as faculty adviser for the student-born business and helped pay for summer interns, to prepare for the fall relaunch. The Campus Bubble (the parent company) has also garnered the support of a small handful of investors, he confirms. "It's still early, but I think they're doing very well," Goetz says. "Like most entrepreneurs, they found an unmet need in the marketplace — everyone is looking for information in a format that is as relevant and user-friendly as possible," he explains. "Campus Bubble will be delivering this to students at Emory this fall, and if all goes as planned, it could be applicable to all universities in the country." While the team envisions using The Emory Bubble as a template for a broader, national vision, even contemplating a corporate application, "Our biggest goal has been to make something the Emory community can enjoy and find use in," McCall says. "We're trying to take it one step at a time and stay focused."